Ravin Crossbows is a newcomer to the x-bow business, and it’s already making a name for itself. During the largest, most exclusive shooting event of the year in 2017, Industry Day on the Range, Ravin completely stole the show and had the longest line of any on the firing line with its Ravin R9 Predator crossbow. Let’s take a look at how that could happen. 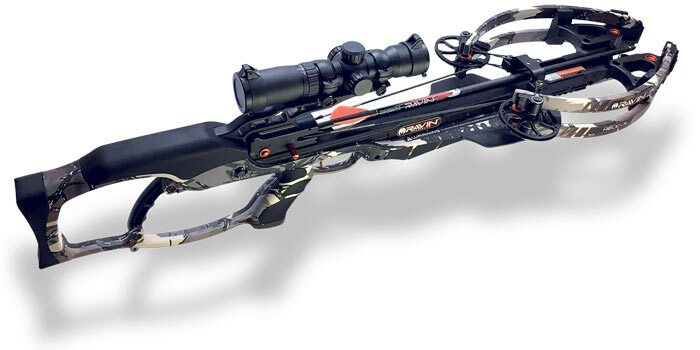 When I first got my eyes on the Ravin R9 Predator, I thought, “What the heck is that?” This crossbow is designed like no other on the market, with a patented HeliCoil technology that coils the cables away from both the top and bottom of the coils in helical grooves. Because of this, the cams are kept perfectly balanced, and the speed is greatly increased along with downrange accuracy. Or so Ravin says; I was determined to find out for myself. The design allows the cams to rotate nearly all the way around, to 340 degrees, even as they’re perfectly level when you draw and shoot. One of the results of this is an arrow and string that completely free-float when you fire the weapon. There’s no friction at all, because the arrow and string don’t even touch the rail. Seems like voodoo magic to me, but it works. The speed and accuracy are definitely increased over more traditional x-bows, as you’ll find out as you keep reading. Your Ravin R9 Predator will come fully assembled. All you have to do is mount the scope, quiver, and cocking handle. Easy experiences, all. Once done, you’re ready to sight in and start having fun. Sighting in the Ravin R9 Predator was easier than I thought it would be, and I was shooting 1/2-inch patterns from 25 yards in a matter of minutes. The included scope is good out to 100 yards, and Ravin insists this x-bow can be deadly accurate at that range, so I moved out that far for the next part of my testing. Once sighted in, the scope seems to hold zero indefinitely, but this is such a new model it’s too early to say for certain. Early indications are good, though. From 100 yards, I was easily maintaining 3-inch groupings. There was almost no loss in power, either – from 100 yards, my arrows went all the way through my foam target, almost knocking it over, and dove halfway into the backstop. For the record, this crossbow fires with a velocity of 390 fps and has 135 foot-pounds of kinetic energy. That’s more than enough penetrating power to take down even the mighty Cape buffalo. This model comes with a 100-yard illuminated crossbow scope. I love the fact that the scope is illuminated, but I love the fact that it’s deadly accurate even more. It sights in like nobody’s business, holds zero quite well, and is well-built. You can adjust the scope for various velocities, which is necessary because the same scope is used on both the R9 and its faster brother, the R15. The scope really is good out to 100 yards, with an aiming point specific for that range. Illumination is nice, and the brightness settings are spot-on for most low-light hunting situations. The only thing I found about the scope is that it doesn’t have the sharpest image quality, but that’s barely noticeable. Since the R9 just came out, I haven’t done much hunting with it yet. 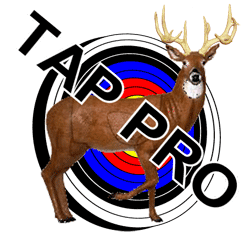 I did, however, get a chance to try it during turkey season, and the results were phenomenal. The R9 helped me bring home a nice tom with a full beard, and he never saw (or heard) it coming. I expect, with the power and accuracy of this crossbow, that it will do me nicely during deer season this year. The only thing I’m concerned about is the noise factor. The R9 Predator is a bit loud, but not terribly so, when fired. What really worries me is the cocking mechanism. This crossbow won’t work with rope cocking aids, and comes only with a hand-crank mechanism. The crank stows nicely in the quiver, but the ratcheting sound can be disconcerting in the field. You can get around that by keeping the ratchet-engagement lever depressed. This can be bad news, though, since you can easily knock your knuckles with the crank handle. The Ravin R9 Predator comes with six Ravin-branded carbon arrows with clip-on nocks. You also get six 100-gr field points. Ravin doesn’t recommend using third-party arrows with its crossbows, because of the unique free-floating design of the firing system. The arrows that come with the R9 use clip-on nocks, which are pretty unique to the industry. With that said, the arrows are perfect for this x-bow. I saw no need to replace them with third-party arrows. Ravin sells extras (at a decent but still inflated price). This is definitely a nice crossbow, and has a lot to love. It features a unique design, inspired by innovation (and a desire to avoid licensing reverse-draw technology). It fires smoothly and powerfully, but is a bit louder than most of the competition. The R9 is hard-hitting and accurate, and should work nicely during hunting season. 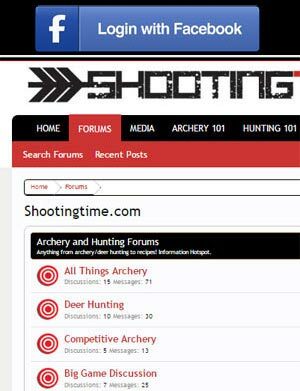 For more information, check out their website at http://ravincrossbows.com/.